About 10,000 gallons spilled over a half mile area, with oil knee deep in some places. The spill occurred within half a mile of the Los Angeles River. Efforts have been supposed made to close drainage pipes to the river, but more information is needed on whether containment has been successful. Nearby businesses have been evacuated and two people have been hospitalized with respiratory concerns from the spill. Residents over a mile away are complaining of the stench. Despite automated shut-off, the valve where the rupture occurred sprayed oil for about 45 minutes before further spilling ceased. Mountain lion sharpening its claws. Unfortunately, information about these spills tend worsen over time. Hopefully, that is not the case in this instance. An oil spill in the middle of Los Angeles can significantly impact both people and wildlife. Many would be surprised to know that Los Angeles—the second largest city in the nation—is teeming with wildlife and possesses an impressive array of biodiversity. The Secretary of the U.S. Department of the Interior, Sally Jewell, recently selected Los Angeles as one of eight pilot cities under the Urban Wildlife Refuge Initiative to connect urban youth with the great outdoors. The oil spill occurred not far from Griffith Park, the largest municipal park that contains wilderness and where a mountain lion has incredibly made his home. Wildlife in urban areas exist on the margins and an oil spill can have devastating effects on the animals in an area. An Isolated Incident? Not A Chance. In October, an 840,000-gallon oil pipeline rupture in North Dakota contaminated wheat fields. In March of 2013, a 210,000-gallon Exxon Mobil Pegasus tar sands oil pipeline disaster in Mayflower, Arkansas pushed at least 22 families from their homes permanently. In 2011, an Exxon Mobil pipeline spilled 63,000 gallons into the Yellowstone River contaminating miles of the river as well as riverside farms, property and habitat area. In 2010, an Enbridge pipeline gushed approximately one million gallons into Michigan’s Kalamazoo River, a spill that sent many to the hospital, killed countless animals and continues to pollute the river. While the details of this most recent spill may not be fully known for some time, the need to quickly move away from dangerous oil has never been clearer. 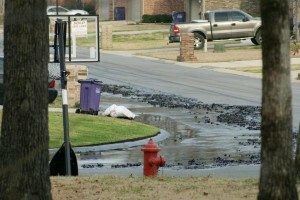 Tar sands gushes into Arkansas neighborhood street after pipeline ruptures. Transporting oil is inherently unsafe, and the scars to communities and habitat areas from disasters last for decades. We can and must move away from oil. Recent fuel economy standards to reduce oil demand is a great start. As is saying no to further unneeded and unsafe pipelines like Keystone XL. When our addition to oil is turning city streets into toxic rivers of sludge, ending our addition may not be just good for people and wildlife, but good politics too.